If a sink, bath or basin refuses to empty, or empties only slowly, the first thing to do is cheek whether the grille of the waste outlet is blocked. If it is not, suspect the trap in the fitting though if more than one filling is affected, the blockage is fur­ther on in the system. A drain-cleaning solution can usually be used for clearing a partially blocked trap these are caustic and should be used with care. The traditional method is to use a plunger. 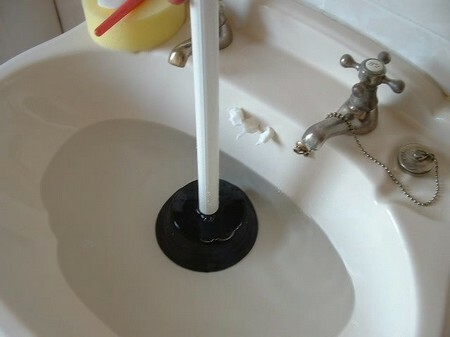 Block up the overflow, fill the bath or sink with water, grease the rim of the plunger cup, place it over the plug hole and pump up and down on the handle keeping the cup in contact with the surface. There are also hand-operated force pumps which work in the same way. If neither of these methods works, the trap itself will have to be cleaned out. Put a bucket under the trap before unscrew­ing it. Older, metal traps should have an access plug at the bottom: unscrew this with a bar or screwdriver, holding the trap itself securely so that it does not turn. The bottom section of a plastic trap unscrews completely; so does the bottom section of a bottle trap. Poke the blockage clear with a piece of wire – a length of net curtain wire, say or a plumber’s ‘snake’. Reassemble the trap, flush through with washing soda, and check for leaks. If the trap is not blocked, the blockage is further down. If a gully is overflowing, the trouble is clearly at that point. Clean­ing the grille of grease and dead leaves may be all that is needed; otherwise check the trap in the gully this is probably most easily cleaned out by hand (or with a flexible drain rod). If the gully is not at fault, the blockage is somewhere in the underground drains. Raising the covers of the inspection chambers in turn, starting with the one nearest the house, will show where the blockage lies it is in the section of drain between the last chamber that contains water, and the first one that contains none. The problem can usually be solved by rodding unless the chamber which contains waste is the last one before the main sewer in the road, or the chamber which is dry is the one nearest the house. Drain rods are thin, flexible canes that can be screwed together to form a longer rod. They can be hired, and come with a set of different fittings to attach to the business end. Screw a couple of rods together with the corkscrew head on the end and push them down the drain in the direction of the blockage, attaching more rods as you go. Be careful to twist the rods in a clockwise direction only, otherwise they may come unscrewed and be lost in the drain. Push against the blockage until it breaks up and clears. If the chamber nearest the house is dry, the problem lies in the soil pipe to the drain, or whatever length of drain lies between the soil pipe and the inspection chamber. The soil pipe should have access doors in it – these should allow all parts of the pipe to be rodded, or it may be possible to rod at least part of the pipe from the drain end. If all this fails, a drain-clearing solution may work, or it may be necessary to call in a specialist drain-clearing firm. If the last chamber has water in it, the blockage lies between here and the public sewer in the road remember that this section of drain is still the responsibility of the householder or in the interceptor trap, if the chamber has one. If you have not examined your drains before, you may need to probe gently with a drain rod to find out whether there is a trap or not unless you are willing to feel with your hands. A blocked trap may be freed by plunging (the drain rod set should come with a plunger end) or by hand. If the blockage is further down, it can be rod­ded through the rodding point, once the stopper in the end of the point has been removed: this may be a piece of slate cemented into place, in which case simply break it; or a stone stopper which has to be pulled out. A particular problem with interceptor traps is that the stopper falls out of its own accord and blocks the trap. Since the water can now escape through the rod­ding eye, the problem is not noticed until the sludge which falls to the bottom of the chamber becomes particularly foul-smelling. Removing the stopper unblocks the trap but the job can be particularly unpleasant. If the stopper falls out repeatedly, attach a chain to it or replace it with a piece of slate, cut to size and cemented into place.